I think I first became aware of supermodel Pat Cleveland's influence through one of the early tales that I'd heard -- that she'd been the one to anonymously buy a plane ticket to Paris for a then struggling designer known as Patrick Kelly. This story managed to come full circle for me upon reading in Pat's new book "Walking with the Muses," (due out June 14), that her great-aunt Leana, a Sunday School teacher in St. Louis, who gave singing and piano lessons to a young Josephine Baker, advised her student to head to the City of Light. The rest of course, is legend as Pat, who began her career walking in an Ebony Fashion Fair, went on to scale the heights of runway walking/dancing, editorial and advertising modeling, also having to head off to Paris to advance her career in the days before New York would even consider featuring a black model on a magazine cover. 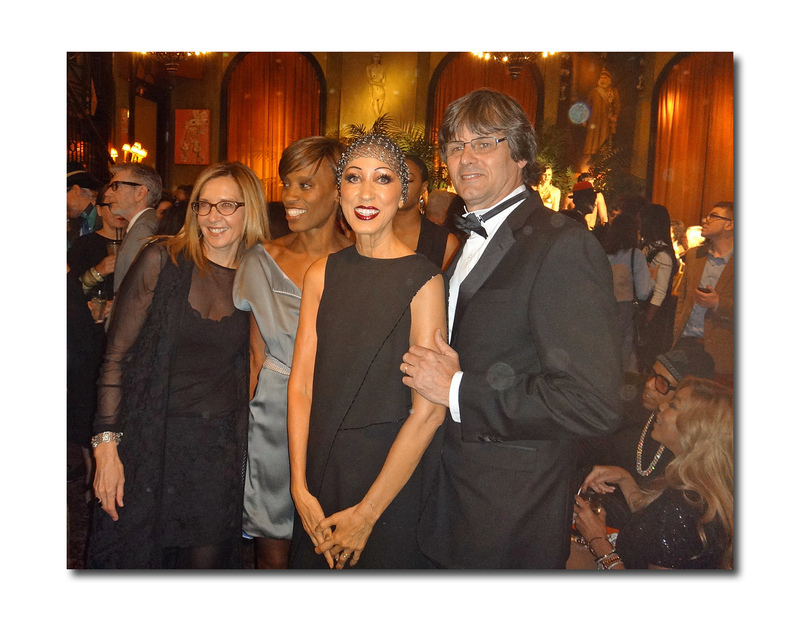 History was made last night with a nod to Paris but still unmistakably New York, at an unbelievable book launch event hosted by Andre Leon Talley, Zac Posen, Anna Cleveland, Sean MacPherson, David Kuhn and Rachelle Hruska which celebrated Pat and her beautiful family, her 50-year long and still ongoing career, and her La Vie en Rose. 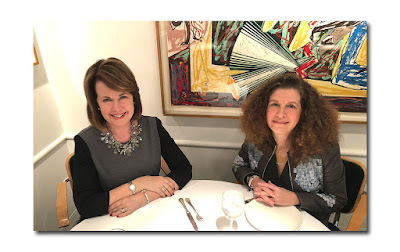 Pat is the thinking woman's Forrest Gump -- she's been involved in the lives of so many earth shakers, both in the fashion world as muses to Karl Lagerfeld, Yves Saint Laurent, Thierry Mugler (among others) and with relationships to Mick Jagger, Warren Beatty and Muhammed Ali. This week she gave a snippet of her brief and early (she was 16 at the time) relationship with Ali who she called "a giant teddy bear." I had been looking forward to this event for several weeks and I will say that the evening was literally everything to the point where I didn't know what to look at next. 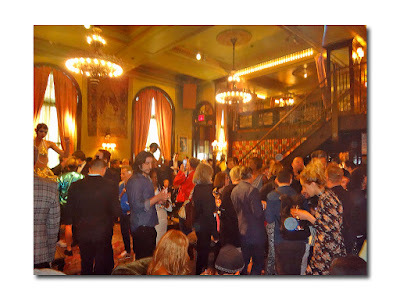 Walking into The Ballroom at the Jane Hotel, which is set up like a large living room-- that is if your living room had a disco ball and an upstairs level-- I was immediately struck by a golden banana-skirted man, definitely not an everyday sighting. I will resist the temptation to comment on the size of the bananas (haha). 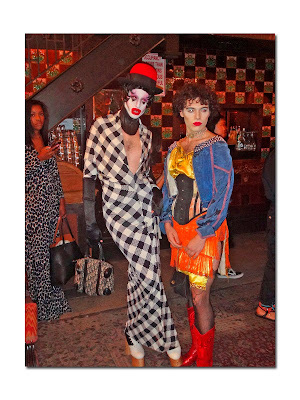 Of course, Pat was known for paying homage to friend/mentor Ms. Baker and for wearing the Danse Banane costume as adapted by Patrick Kelly, so this was not completely unexpected. 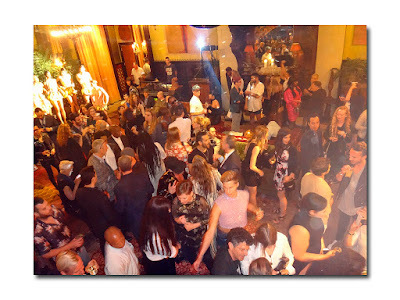 As I fully entered the room I saw several male and female model/dancers both on the small stage and dancing on the cocktail tables, making setting down my delicious vodka, cucumber and grapefruit drink an impossibility. The room began to steadily fill with more luminaries than you could shake a banana at including Ken Downing, Lauren Ezersky, Debbie Dickinson, Francisco Costa, Calvin Klein, Simon Doonan, Wendy Williams (she's actually very thin in person), Rose Hartman, Grace Bol, Scooter LaForge, Roxanne Lowit, Mark Bouwer, Maye Musk, Joey Arias, Stephen Burrows, Susanne Bartsch, Amy Fine Collins, Donna Jordan, Ralph Rucci, Zaldy, Tatjana Patitz, Garance Dore, Amanda Lepore, Dorinda Medley, Kenny Kenny, numerous "Club Kids" (both of the 70's and now), Idiosyncratic Fashionistas, trannies, photographers and even a few regular people. Naturally MX QWERRRK (the giant pig mascot) showed up. Donna Summer expressed the sentiment best as "I Feel Love" and other disco selections pumped through the speakers, recreating the Studio 54 vibe but without the lines of coke on the table (that I saw anyway lol). Pat swooped in with a grand appearance, looking majestic in a long black gown with a crystal veil/snood covering her pinned up hair. She posed with her husband, Paul van Ravenstein, for photographers who couldn't get enough, then she kissed her way through the crowd of old friends and well-wishers. 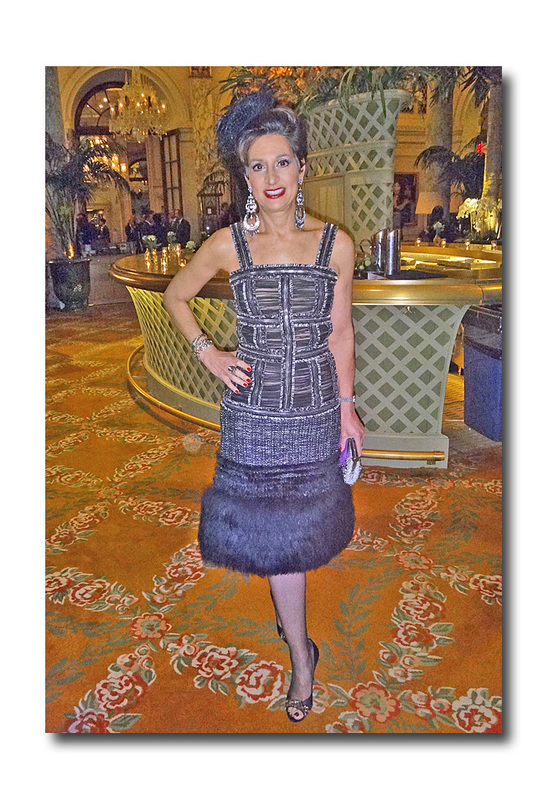 Her daughter Anna in a long black sequin skin exposing gown also posed happily for photos. As quickly as they appeared, so they vanished -- Pat ostensibly to get ready for her "close-up" or rather her "performance." The crowd became so thick that any changing of place was not an option. My claustrophobia started to kick in but due to the extra high ceilings I was able to put myself into a relatively Zen state...that is until an overzealous photog nearly knocked me over causing a woman seated on a nearby couch to panic that I would fall on her. Chill, hon -- it's all good! I had been hovering near the stage thinking that that's where the performance would occur so I was slightly surprised when I heard a voice from the balcony. 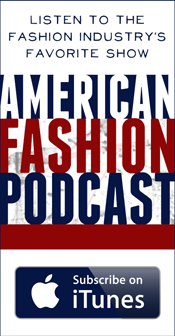 At approximately 8:45, Designer Zac Posen, who has used both Pat and Anna as his muses, introduced the boundary breaking Cleveland and her act. "Everyone say 'Tonight Josephine'" he instructed and the crowd obeyed. 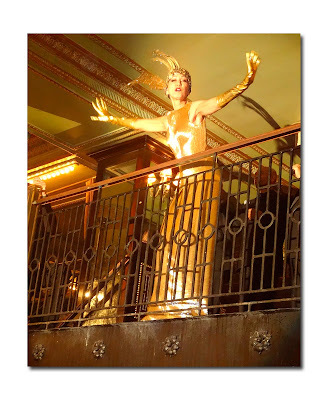 Assisted by several tuxedoed singing men, Pat made her gilded debut, dramatically and energetically lip-synching, vogueing and emoting from her balcony perch, using the men and the stairway railing as props. "Tonight I belong to you and I know you belong to me," she mouthed while alternately opening her arms in an all encompassing embrace, then hugging herself as her fans craned their necks adoringly. It was truly "a moment" -- equal parts Folies Bergere, Sunset Boulevard and just good campy fun, the likes of which are scarce these days, as Pat hammed it up, enthralling the room. 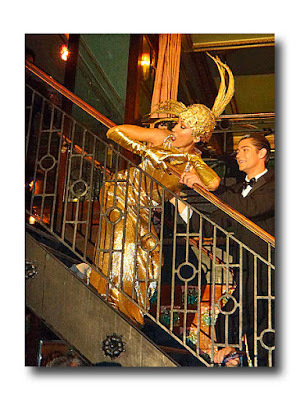 When the performance was over she descended the staircase to pose onstage with the banana dancers. The official event hashtag is #patclevelandbook if you want to search for snippets of her performance, but #icon, #unforgettable, and my vote for #partyofthesummer, are also apt. Highlights of the evening for me, besides just being there, included running into my former hairdresser/old family friend from Philly, as well as being told by several cross dressers or trannys that I looked great. Can't get a better compliment than that as far as I'm concerned! As for the book sales (this was ostensibly a book launch, y'know) they were being quietly peddled over in an obscure corner. 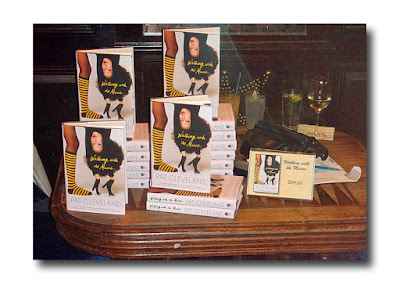 There was actually some confusion over where to find them, unlike the usual book launch where they're front and center. I realized that Pat's June 23 birthday is approaching so perhaps this evening marks a bit of a b'day celebration as well as a celebration of her memoirs. I tucked my copy under my arm (it promises to be a great read) and departed.